Increasingly the performance of cloud solutions depends upon the entire shared service supply chain from network to data center to IT equipment. In understanding the overall resiliency, security and cost effectiveness of a particular solution each of these elements needs to designed and implemented in the most appropriate manner and to build enterprise class solutions in particular requires consideration of the data center element. This presentation will look at the role and contribution that the design or selection of enterprise class data centres have in the resiliency, security and lifecycle costs of cloud configurations and Professor Kehoe will illustrate these concepts by presenting a use case in health data storage. 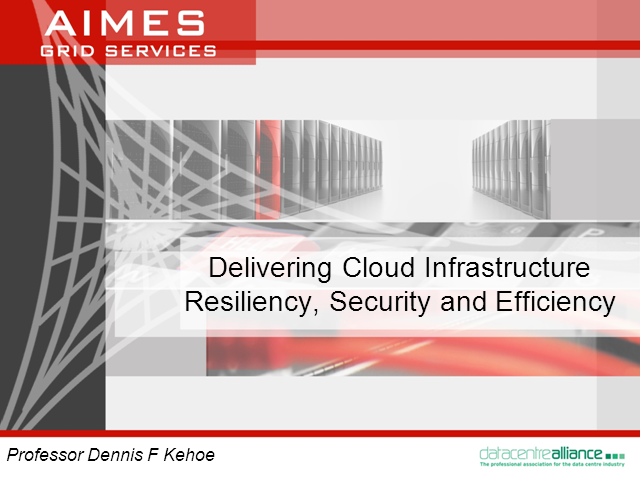 Professor Kehoe is CEO at AIMES Grid Services who are a cloud services provider based in the North West where they build and operate enterprise class data centers specifically for the hosting of cloud infrastructure. He is also Deputy Chair of the Data Centre Alliance which is a professional association comprising of Industry leaders from across the data center Industry.